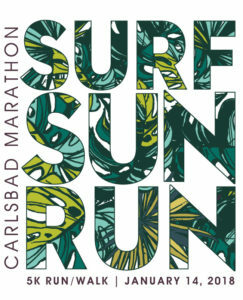 New Surf Sun Run 5K! Have you heard? We’ve added a 5K to our race day lineup! Encourage your family and friends to register for this inaugural event. They can run or walk the 5K and be finished in plenty of time to cheer you in for your finish! The Surf Sun Run 5K is the first race of our new SoCal 3×5 challenge. Complete the Surf Sun Run 5K on January 14, the La Jolla Shores 5K on April 22 and the America’s Finest City 5K on August 19 and receive an additional medal at the finish line of the third and final race! Space is limited, learn more and register today.